Most of the time I prefer to make my a posteriori conlangs as realistic as possible, which of course hinders the speed at which I can conlang. So to change things up a bit, I simply started working on Zhér·dûn, a conlang I give the realistic side of things a pass with. Zhér·dûn is its own independent branch of the Germanic language family, characterised by its analytic grammar and primarily by the fact that it is a tonal language. Zhér·dûn has 18 consonants of which all can be used as onsets. As a matter of fact, this is the only place where they are allowed as the language doesn't allow coda consonants. An empty onset is also allowed, which means that there are 19 possible ways to start a syllable in Zhér·dûn. The vowel system of Zhér·dûn is a simple 5-vowel-system with diphthongs in the place of the two standard mid-vowels. However, there are three additional ways to pronounce each vowel: nasal, rhotic and nasal-rhotic. These change the pronunciation of most vowels a little bit. This creates 20 possible codas for Zhér·dûn which each can have one of the language's five tones. Now onto a brief overview on the historical development of Zhér·dûn which is mostly defined by mergers, reductions and cluster simplification. I believe those might not be all of the changes, but I think it shows practically everything that happened from Proto-Germanic to Zhér·dûn. Some quick vocabulary to end this post and to please Janko. I will show the historical development of these numbers as well, they can be found in the spoiler. É é è à a á. Not sure about the grammar yet so that sentence might change. Last edited by ixals on 06 Mar 2019 14:49, edited 8 times in total. This is an interesting conlang - a Germanic language that resembles an East Asian language! There probably is no plausible place where such a language could be spoken "in the real world", but as an experiment, it is nice. Actually, if Ixals would make this North Germanic, we could say descendants of the Rus or Hadrada's Vikings pushed East to China, it could work. I was replying to WeepingElf's assertion to the contrary, without passing judgement on it, that is, showing how in their paradigm, it could still work. You should have replied to them, as my comment was clearly in reference to their paradigm. Could you explain the tonogenesis a bit more. I really enjoy reading about it and I have to admit that I don't fully understand that part of the sound changes section. Maybe a table with the syllables types in the proto languages that correspond to each of the tones now? I'll start with the coda consonants because there are less exceptions. So basically all coda fricatives merge into /h/ and all coda stops merge into /ʔ/. Combinations of these two turn into /hʔ/. /at > aʔ/, /as > ah/, /asp > ahʔ/ and then /aks/ which also experiences metathesis (/aks > aʔh > ahʔ/). An empty coda stays empty - obviously. Then the glottal stop changes into high tone, /h/ into low tone and the combinations in a neutral tone. Combinations of low tone creating consonants and high tone creating ones result in neutral tones. So practically /sp st sk/ create neutral tones and then get rid of the /s/. Empty onsets make vowels neutral tone as well - again: obviously. And finally, these two created tones (the one from onsets and the one from coda consonants) merge into a single tone. To summarise it, if the two tones are the same, they just merge into a flat tone. If they are different, they are either rising and falling. If the onset's created tone is higher than the coda's, it turns into a falling tone, but if it is lower, a rising tone is the result. /kat/ "cat": The voiceless stop creates a high tone and the final stop creates a high tone as well. The final result is a high tone /ka˥/. /r̥os/ "horse": The voiceless sonorant creates a high tone (before merging with /x/) and the final fricative creates a low tone instead. This results into a falling tone, so /xɔu̯˥˩/. /seks/ "six": The voicess fricative creates a low tone this time and the combination of stop and fricative in the coda creates a neutral tone. Because the low tone is lower than the neutral tone, the result is /sɛi̯˩˥/ with a rising tone. As I am working on Zhér·dûn as I write these posts, things will change because they don't work out as planned. I try to add everything that changed in a short list of all the changes in previous posts at the beginning of each new one. Zhér·dûn has not fully lost its case system inherited from Proto-Germanic, but it shrinked dramatically. The dative and instrumental merged early on as in every other sister language and the genitive was replaced by a prepositional construction. Later, the accusative and dative also merged, leaving Zhér·dûn with a two-case-system of nominative vs. oblique. While the nominative is only used for subjects, the oblique is used for direct objects as well as after prepositions. These cases are not visible on nouns, but so far only on definitive articles and personal pronouns. One thing that Zhér·dûn has retained better than some other Germanic languages is grammatical gender of nouns. All three of the Germanic genders are still used in Zhér·dûn, masculine, feminine and neuter. This distinction is not very obvious in most cases and is also only present - like case - in definite articles. More about these two concepts later. As I mentioned in the previous paragraph, personal pronouns are one of the things that have a case distinction. Zhér·dûn has three persons with singular and plural forms. The dual number died out in Zhér·dûn, however some of the modern pronouns are derived from the old dual pronouns. 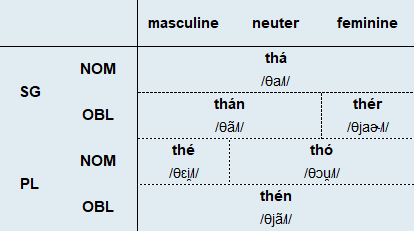 The following table gives a quick overview of all the pronouns in Zhér·dûn. As you can see, the third person pronouns are missing and the answer to that is quite simple: Independent third person pronouns do not exist and the definite articles are used to express he/she/it/etc. in all cases. The articles can be found in the next section. There has been some stuff happening in Zhér·dûn concerning its pronouns. Shared with North-West Germanic is the analogical change from *jūz to *jīz for the second person plural due to the similar sounding *wīz. Then, the oblique plural pronouns are derived from the old Germanic dual pronouns *unk(iz) and *inkw(iz). The use of the dual for plural meaning happened to the first person first and only then the second person followed due to analogy. Tho2 kho4 e2 ther2 do5. "The horses eat the dove." The2 kho4 e2 than2 do5. "The grapes eat the death." As an uncountable mass noun, de4 is generally used without any articles at all. Indefinite plurals are also expressed by using no articles at all. "I drink tea." ~ "Tea is what I drink." "Tea drinks me" ~ "It is me who the tea drinks." "The horse drinks tea." ~ "Tea is what the horse drinks." This flexibility cannot be done in cases where it is not possible to see which noun assumes which role. In this case, the subject and the object cannot switch positions as Do5 e2 kho4 could only interpreted as the opposite: Doves eat horses. Last edited by ixals on 06 Feb 2019 23:10, edited 1 time in total. most Germanic languages use intonation for this purpose. This is rather complicated in a tone language -- not impossible to do, but definitely advanced conlanging. (almost) all natlangs have some way to indicate information structure. tonal languages I know of either use word order (Mandarin) or other markers to convey these categories. It would also be really cool to have a Tone Sandhi rule applying only in focus/topic position, similar to Bantu and/or West African languages. This could diachronically stem from the Intonation strategy that other Germanic natlangs use. Today's post focuses on verbs. Verbal morphology is pretty simple in Zhér·dûn as it has lost pretty much all of its former inherited conjugation due to vowel reduction and deleted consonants. This leaves Zhér·dûn's verbs bar very few exception with just one form. Tense and the like are expressed by periphrastic construction. One of these is the past tense. The past tense is formed by the kha2 followed by the verb that is supposed to be in the past tense. What might be interesting is that kha2 is a merger from earlier /ˈxab/ have and /ˈxad/ had, both being cognate to English have. The usage of kha2 to mean have died out in Zhér·dûn though and is now expressed by e4, cognate to English owe/own/ought. The past tense encompasses everything that is expressed by English's past tenses. So the sentence could also mean "We have eaten it", "We had eaten it", "We were eating it", "We had been eating it", etc., unless further specified by adverbs for example. The future tense is also expressed by an auxiliary verb in front of the main verb. This time it is shor2 which is cognate to other Germanic language's future marker, e.g. Swedish skola and English shall. Similar to the past, a difference between will and going to kinds of futures doesn't exist either. She4 shor2 e4 a3 sur5. "You will have eight swords." Tha2 kha2 shor2 bo2 in3 Khan2·bur5. "He/she was going to live in Hamburg." Tha2 shór kha2 bo2 in3 Khan2·bur5. "He/she will have lived in Hamburg." As can be seen, pha4 is a verb with distinct present and past tenses. The present tense is of course used to signify the present tense whereas the past form is used when a normal verb would use the auxiliary kha2. The infinitive is used in any other case, for example when used as a noun or in combination with other auxiliaries. One can of course find kha2 pha4 in certain construction. Colloquially, the construction kha2 pha4 standing alone exists to mark the past tense but its use is discouraged. Here, the pha4 is in its infinitive although it is not able to be distinguished with the past pha4. Thu2 shor2 kha2 pha4 en3 a2. "You will have been a monkey." The second example sentence also shows that pha4 also does not use the oblique, but instead uses the nominative for both the subject and the object. The third sentence gives an example of when kha2 pha4 is allowed, but if we were to say Phe4 kha2 pha4 phe4 it would be wrong although it can be heard in lazy speech from time to time. Negation is also pretty simple in Zhér·dûn. For now, I will only talk about the simple negation à la don't [verb]. Verbs are negated by the use of the adverb ne2. It is placed immediately after the first verb. That means that in case of auxiliaries, the negation is put after the auxiliary. Thu2 kha2 ne2 than2 do5. "You didn't see the death." "Oaks are what I don't eat." ~ "Not oaks is what I eat." Ne2 in3 Khan2·bur5 bo2 e2. "In Hamburg is where I don't live." ~ "Not in Hamburg is where I live." Sorry for bothering you and jumping ahead, but today I was wondering how passives will be formed in Zhér·dûn. It seems to me that Germanic languages use a variety of auxiliary verbs/light verbs. German uses sein to be, werden to become, and bekommen to get. English uses at least to be and to get. Some North Germanic languages have a passive suffix on the other hand, IIRC. This is also connected to my earlier question, because a passive can be used for information structural reasons, i.e. marking topic or focus. Akan uses tone raising to mark a focussed constituent. The main ressource is behind a paywall. PM me, maybe I can get a copy somewhere. Gotta say...this would be fun to learn. As far as my calculations are concerned, you have 1900 possible combinations. That DOES make me wary of the productive versatility of this language. How DO you work out compound words? Similar to the general analytic nature of Chinese and German, I assume. Can you, ultimately, provide examples of a few? Oh, and why is "monkey" ONE syllable? Care to show the evolution of THAT one? I would suspect it's cognate to English ape, but I would also be really happy to see the derivation. This post is again about Zhér·dûn's verbs. Early on in the language's history, a way of forming the passive similar to the Scandinavian languages developed. In Zhér·dûn, the former reflexive pronoun *sek/*sik lost its original meaning over time and is now solely used for the passive voice. It did not develop in a suffix like in North Germanic languages, but is still its own word: se2. This particle (?) is added directly behind a verb. In negated sentences, the passive marker is put between the main verb and the negative particle. La1 kha2 ne2 se2 la4. The positions of the negation and the passive particles are switched here because the passive has to be put in front of an infinitive whereas the negation belongs to the auxiliary verb kha2 and therefore has to follow it. The causative and the inchoative are not ways to modify verbs further in Zhér·dûn. Instead, they can only be used in combination with an adjective and generally have the meaning of to make something X (causative) and to become X (inchoative). Their meaning is generally straightforward but in some cases, they developed special meanings. The inchoative is formed with the verb pher4 which stems from the Proto-Germanic word *werþaną. The causative is formed with the verb ma2, from *makōną and therefore cognate to English's to make. Tha2 e4 ma2 se2 she2. And to end this post, just something quicker: numbers. I already presented the numbers from one to ten but I will list them here again in case they were forgotten. "one, two, three, four, five, six, seven, eight, nine, ten"
Zhér·dûn's way of counting for higher numbers is pretty similar to its Germanic sister languages. For the numbers from eleven to nineteen, the numbers are generally formed by adding ze4 after the number. Like other Germanic languages, the numbers for eleven and twelve are an exception and were inherited from *ainalif and *twalif. "eleven, twelve, thirteen, fourteen, fifteen, sixteen, seventeen, eighteen, nineteen"
To form groups of tens other than ten itself - speak thirty, fourty, etc. -, the ze4 is replaced with the suffix for groups of tens, zi4, which comes from Proto-Germanic *tigiwiz. Again, there is an exception to this and this is the number twenty. As this is a mouthful, the o2 is commonly dropped here in colloquial speech, so one can hear phin5·se2·zi4 most of the time. Last edited by ixals on 23 Feb 2019 20:28, edited 1 time in total. In polysyllabic words and just like /n/, final /r/ is also deleted. That mean that words like *austraz "east" first change to austar and end up as just aust before the tonogenesis hits Zhér·dûn. I also added the change of /sw/ > /zw/ to allow for syllables that start with /s/ and have a high or falling tone, which didn't exist before due to the missing /z/ in the phoneme inventory. The /w/ is either deleted or merges with the vowel. Zhér·dûn also possesses separable verbs similarly to German, however the rules for when the verb is seperated and when it is not are a bit different. In Zhér·dûn, there are simple verbs like e2 "to eat" or gan2 "to go". But there are also separable verbs made out of a simple verb and an added prefix - like in3·gan2 "to enter" for example - which can be seen either seperated or fused together. "You go in." ~ "You enter." "You went in." ~ "You entered." So when the separable verb is the "conjugated" verb in a sentence, it is seperated as can be seen in the first example. The second sentence requires the past because of the auxiliary verb kha2 and the past is always the prefixed form just like the infinitive. Also notice that there is a difference between ga2 and gan2, similar to the copula. A more unusual thing that Zhér·dûn does, is to use the fused form of a separable verb whenever there is an object following the verb. That means that in general it is more common to find the fused form. If the following sentence hadn't been used with an object, it would have been only E2 la4 ni5 for example. "I beat down the glass." Thu2 ga2 in3 than2 bu2·kho5. "You go in the library." ~ "You walk around inside the library." Thu2 ga2 in3 in3 than2 bu2·kho5. "You go in in the library." ~ "You enter (something) inside the library." Thu2 in3·ga2 in3 than2 bu2·kho5. "You go into the library." ~ "You enter the library." The first sentence is just a simple verb gan2 with an added adverb of place following it. But if the speaker wants to say that they are going into the library, the separable verb in3·gan2 "to enter" has to be used with the object (aka what the speaker wants to enter). As the object has to follow the verb, the verb has to be used in its combined form like in sentence number three, because otherwise the in3 than2 bu2·kho5 would be interpreted as an adverb as place as can be seen in the second example. This distinction is not made in the infinitive as the infinitive is always used in the fused form. Thu2 kha2 in3·gan2 in3 than2 bu2·kho5. "You entered the library." or: "You entered (something) inside the library." When the sentence order is changed so that the subject does not stand in front of the verb, the subject has to follow it. In case of separable verbs, the subject squeezes itself inbetween the verb and the "prefix" - that stands now at the end of the sentence - if it is a pronoun, which is a left over from the older word order. Other sentences just switch the subject and the object in that case and the fused form is retained. In3 than2 shu5·bi2 ga2 phe4 in3. "The shoe store is what we enter." Ther2 do5 ni5·la4 tha2 kho4. "The dove is what the horse beats down." Whenever there is no object, there is a fixed order on how to arrange the verbal, passive and negative particles. The order is the same as when used without a separable verb, except for the verbal particle that is put at the end of the sentence. In sentences without objects that is, otherwise the particle is fused to the verb. Thu2 la4 se2 ne2 ni5. "You are not beaten down." Last edited by ixals on 23 Feb 2019 19:07, edited 2 times in total. I enjoyed the post on seperable verbs. Maybe you could say that the separated form is kind of a present tense antipassive? It only occurs in the absence of an overt object in the present tense. Two related questions: Can adverbs come in between the parts of a separable verb? What is the passive form of separable verbs? Thanks for another one of your comments! Hm, after reading through the antipassive article on Wikipedia I can see similarities, however I don't think I know enough about the antipassive to say whether or not the Zhér·dûn construction is one as well. Thanks for the other two question! Adverbs are placed at the very end of a sentence so the particle of the verb comes before the adverb. The passive - like the negative - come inbetween the separable verb. I added another sentence (Thu2 la4 se2 ne2 ni5) to the last post that shows the order of that. /w/ between a consonant and a vowel does not merge with the vowel anymore in some cases. So sur4 "sword" changes to ser4. This is just one of the many examples. Retaining the old verb for "to fell", pher2, in a sentence like phe4 pher4 e2·co4 would have had the extra benefit of meaning both "We fell oak trees" as well as "We fart oak trees" which is something that people would like to avoid, I'd say. Comparatives and superlatives are also fairly easy in Zhér·dûn. They are formed by putting the adverbs more and most in front of the adjective. This is done for all adjectives except two. They have a special form for the comparative that is used on its own for the comparative degree and in combination with the adverb most for the superlative. Pin2·shir5 ir3 tha2 me2 si1 gen4 a4 Go1·man2·khan2. "Brunhild is the cutest woman in Copenhagen." The comparative degree can be used with definite, indefinite or no articles depending on the meaning. To compare something to something else, the construction in Zhér·dûn is also formed similarly to its sister languages. The conjunction used for this is the preposition da4 "to" which is a shortening of an earlier construction identical to "in comparison to". E2·co4 ir3 be2 da4 a4·co4. "Oak trees are better than ash trees." Thu2 ir3 mer2 shon1 da4 me2. "You are younger than me." Bor4·lan2 ir3 min2 gar1 da4 Nor5·phe4. "Poland is less cold than Norway." Tho2 tho4·zo2 pha4 shu5 a4 Pin2·shir5 ir3 tho2 me2 min2 gu5 shu5 a4 ther2. "The purple shoes of Brunhild are her least good shoes." ~ "Brunhild's purple shoes are her worst shoes." Tha2 ber4 kha2 se2 ne2 be2 ther5 than2 go1·man2. "The pear wasn't bitten by the merchant." Ne2 ther5 un2 la4 se2 tha2 gen4. "Not by us was the woman beaten." ~ "The woman wasn't beaten by us." In the previous post I originally added a sentence featuring an adjective describing a noun. After focusing more an descriptors for nouns, I noticed that the way I did it before would result in many misunderstandings. The old present participles that could be used as adjectives merged - as all the other forms of verbs - into one single form in modern Zhér·dûn (*slahandz > *slahn > *slah > la4 vs. *slahaną > *slahn > *slah > la4). Adjectives also have one single form, therefore there is no visible distinction of what's a verb and what's an adjective describing a noun. So if we take the word zo2 for example, a sentence like tha2 zo2 so2 could mean either "the blue lake" or "the dying lake". To create a distinction, speakers of Zhér·dûn began to use the "participle" of the copula whenever adjectives modify a noun. The literal translation for a sentence like "the blue lake" would therefore be "the blue being lake". This also results in the fact, that noun can now only be described by verbs in the modern language. Tha2 se5 than2 zo2 pha4 so2. "He/She sees the blue lake." Thu2 e2 ther2 be2 la1. "You eat the biting snake." Zhér·dûn - so far - only forms grammatical modifiers by placing them in front of nouns by the use of a verb. This means there is no typical construction along the lines of "the X that does X". For some things that would normally not be expressed with a verb - like adjectives for example -, the copula is used. Locations are one of these things for example. Phe4 kha2 ther2 in3 Dan2·mar2 pha4 gen4. "We hate the woman in Denmark." ~ "We hate the woman that is in Denmark." Notice that in this case, the copula is directly in front of the verb and the location is in front of the verb. So the order is flipped around compared to the simple SVO sentence tha2 gen4 ir3 in3 Dan2·mar2 ("the woman is in Denmark"). As a matter of fact, this inversion is the most important thing one needs to know for attributes of nouns. The order is most often inversed in these cases. Tha2 ga1 kha2 ne2 se2 go1 ther5 then2 in3 bur5·mi2 a4 Go1·man2·khan2. "The cat was not bought by them in the city centre of Copenhagen." E2 shor2 kha2 kha2 ther2 in3 ther2 bur5·mi2 a4 Go1·man2·khan2 ther5 then2 ne2 se2 go1 kha2 ga1. "I will have hated the cat that was not bought by them in the city centre of Copenhagen." This rather long sentence shows the inversion pretty well as it features a row of different parts that are affected by this rearrangement. This post will feature three rather short grammatical features. The first one is the genitive case which was already featured in previous posts, but I thought it would be good to give a quick overview separately. The genitive in Zhér·dûn is marked by the preposition a4, which is a cognate to English's preposition of. As expected, the original Proto-Germanic way of marking the genitive by adding a suffix at the end of a noun died out completely in Zhér·dûn. So one will never see "Brunhild's house", but always "the house of Brunhild". Thu2 se5 than2 kho5 a4 Pin2·shir2. Phe4 e2 enr3·bo5 a4 gi1 pha4 tha1. "We eat elbows of quick rats." Zhér·dûn also lost its possessive determiners like my and your, so expressing these is also done by the preposition a4 followed by the oblique case of the personal pronoun. It was retained in some specific words like men2·sher2 which is now a polite term for a man, similarly to French monsieur. Tha2 ga1 a4 me2 kha2 zo2. Thá thî·bén à thér gâ à thér dú à Pín·shír khá sé ché. "The rib of Brunhild's daughter's cat was taken." She4 the1 en3 da5·bu2 da4 me2. "You give a diary to me." ~ "You give me a diary." Da4 the2 se2 tha2 sha4. "To you she says yes." ~ "She tells you yes." Zhér·dûn, like English, developed a specific suffix to turn adjectives into adverbs to describe the manner that something is done with. The suffix for this is phe4 which represents a merger of the descendants of Proto-Germanic *wegaz "way" and *wīsō "manner". Compare the English suffixes -ways and -wise for this, as well as the German adverb forming suffix -erweise. The placement for these types of adverbs is either at the beginning of a sentence or after the object(s) with every other adverb if there are more in the sentence. "You live strictly." ~ "Strictly is how you live." Tha2 khon2 e2 gi1·phe4 in3 than2 kho5. "The dog eats quickly in the house." With the dative, genitive and adverb-forming taken care off, all the grammatical stuff to translate Schleicher's Fable has been discussed, I think. The glosses are in the spoiler, but this time without pronunciation because that's just too much this time. En3 phur4 ne2 e4 sha2 kha2 se5 kho4: en3 kha2 ta4 en3 thun1 pha4 pha4, en3 kha2 ber2 en3 ko2 pha4 bir5, en3 kha2 ber2 en3 gar4 gi1·phe4. Tha2 sha2 kha2 se2 da4 then2 kho4: «Tha2 sher2 a4 me2 phun1 me2, tha2·ze4 e2 se5 en3 kho4 ce5 gar4.» The2 kho4 kha2 se2: «Li4, sha2, tho2 sher2 a4 un2 phun1 un2, tha2·ze4 phe4 se5: en3 gar4, tha2 men2·sher2, ma2 en3 phanr4 pha4 che4·za1 kha4 ther2 phur4 a4 than2 sha2 phir2 than2·ser5. O4 tha2 sha2 e4 ne2 phur4.» Kha2 shor2, tha1 sha1 in3·lo4 in3 than2 li4·lan2. A sheep that had no wool saw horses, one of them pulling a heavy wagon, one carrying a big load, and one carrying a man quickly. The sheep said to the horses: "My heart pains me, seeing a man driving horses." The horses said: "Listen, sheep, our hearts pain us when we see this: a man, the master, makes the wool of the sheep into a warm garment for himself. And the sheep has no wool." Having heard this, the sheep fled into the plain. "The sheep and the horses." "A sheep that had no wool saw horses: one pulled a heavy cart, one carried a big load, ..."
"..., one carried a man quickly. The sheep said to the horses: "My heart hurts me, ..."
"... when I see a man who drives horses." The horses said: "Listen, sheep, our hearts hurt us, ..."
tha2·ze4 phe4 se5: en3 gar4, tha2 men2·sher2, ma2 en3 phanr4 pha4 che4·za1 kha4 ther2 phur4 a4 than2 sha2 phir2 than2·ser5. "... when we see: a man, the master, making a warm garment out of the wool of the sheep for himself." O4 tha2 sha2 e4 ne2 phur4.» Kha2 shor2, tha1 sha1 in3·lo4 in3 than2 li4·lan2. "And the sheep doesn't have wool." Having heard, the sheep fleed into the plain." There will probably be some changes as I work out the grammar of Zhér·dûn more but the basic structure will definitely be the same. Maybe there will be some changes in vocabulary later on, likely che4·za1 and li4·lan2. Apart from that, I'm quite happy with the language so far.